Vinyl Bluebird Houses that Rock and Secret Sauce for Blues! 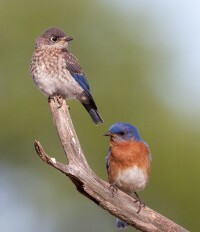 ‘Tis the season, bluebirds are busy claiming territory, finding mates and already nesting in many parts of the country. 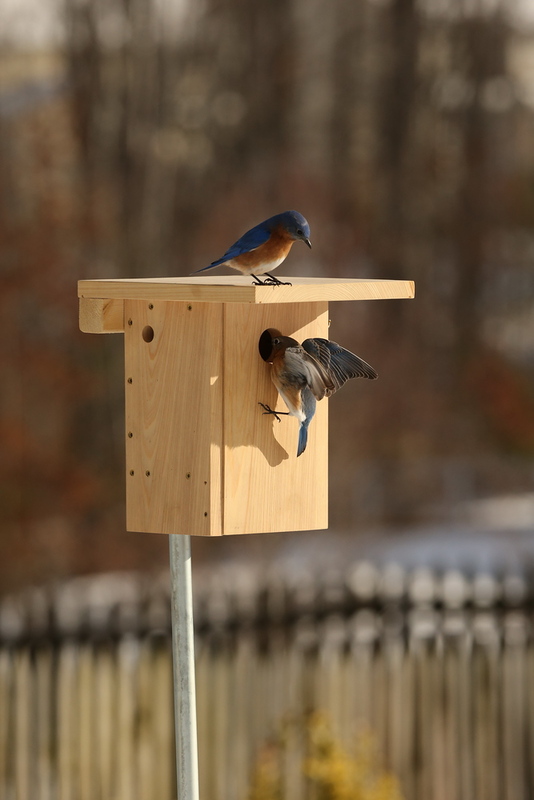 Because they typically have 2-3 broods per season, it’s not too late to entice them to your place with quality bluebird houses. Open spaces best suit blues, with places to perch and swoop up insects. 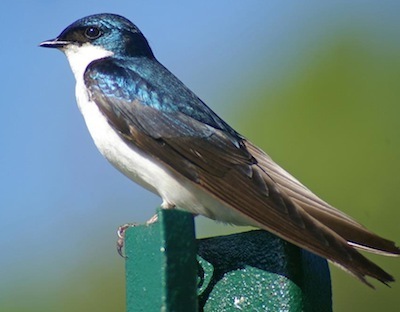 They’ll perch on lower limbs of nearby trees, on top of birdhouses, and even on feeder poles. Not only to hunt prey, but to keep a watchful eye over their box and nestlings as well. They’re such tentative parents, with mom & dad’s teamwork accounting for successful fledges! 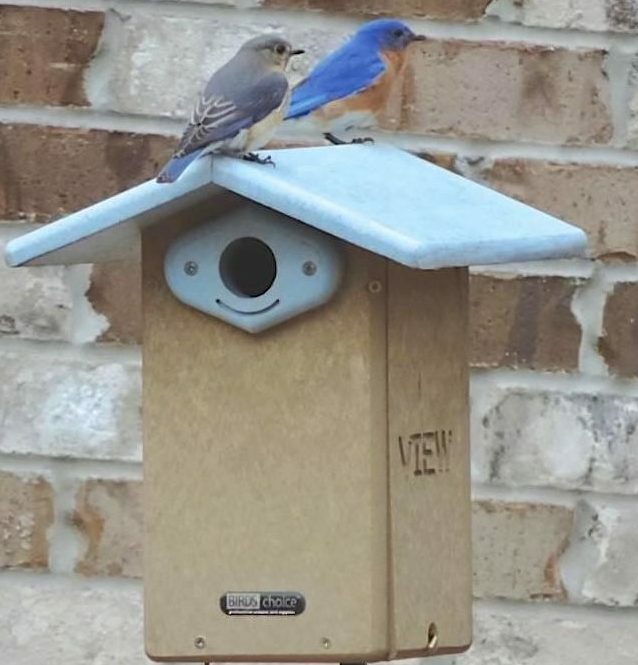 Vinyl bluebird houses rock because they’ll never deteriorate like wood. The light color is better for late summer scorching temperatures too. 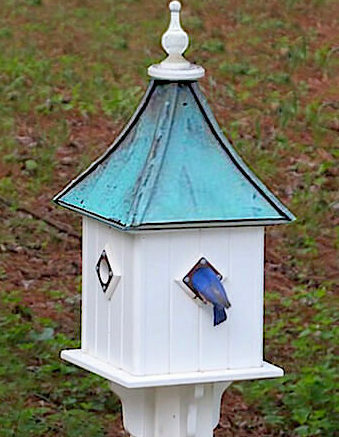 This copper roof bluebird house is complete with predator guard and removable roof for easy nest clean-out. It mounts on a standard 4×4 post… no tools required! 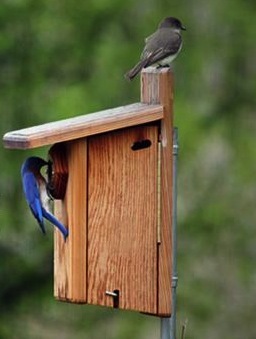 The Gilbertson nest Box is also mighty popular among blues. 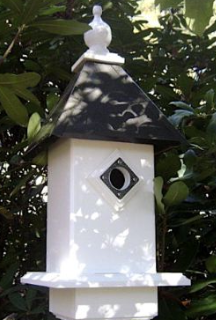 Vinyl with a birch appearance, it’s a great design if you’re up for monitoring nests (recommended). 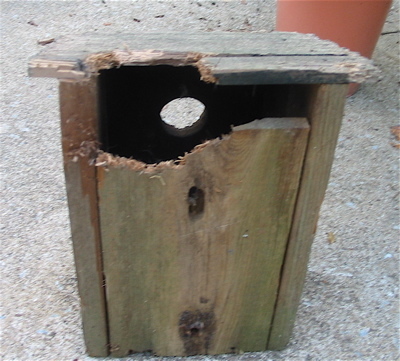 Be polite and always knock first (well, tap) before checking nests! The secret sauce? 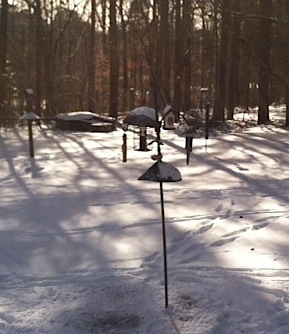 In an attempt to bring bluebirds to our yards, and after exhausting all other food treats to lure them, many folks finally resort to offering live mealworms. They do the trick! But what soon happens with many bird addicts (like any addiction) is we’re feeding too many worms and the bird’s diet is skewed. Extremely high in protein, too many worms can cause problems for female blues during nesting season. Something called egg bound, where she becomes unable to pass/lay her egg. It’s fatal most times, and really sad when seasoned bluebird monitors discover this. It can and does happen in the wild without gorging on meal worms too. 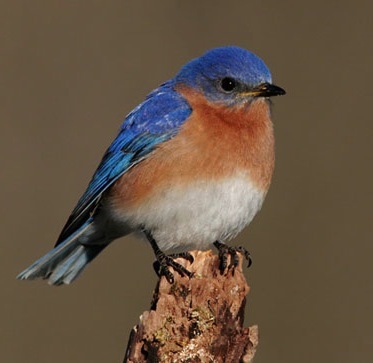 So if you’ve got the bluebird itch and find yourself feeding lots of worms during nesting season, this supplement helps lower the chance of females becoming egg-bound. 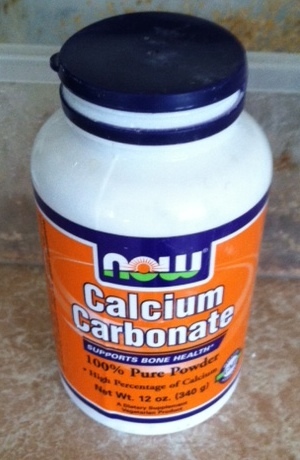 Calcium carbonate powder is widely available online, or maybe at your local health and nutrition store. Just a little in the container with a few shakes & swirls to lightly dust worms is perfect. Doesn’t that sound yummy? 🙂 It also helps other females during nesting season should they be partaking (or stealing) your mealies! 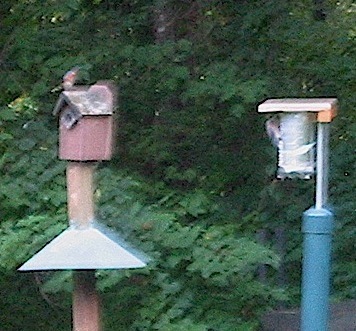 They’ll Be Scouting Bluebird Houses Soon! See? 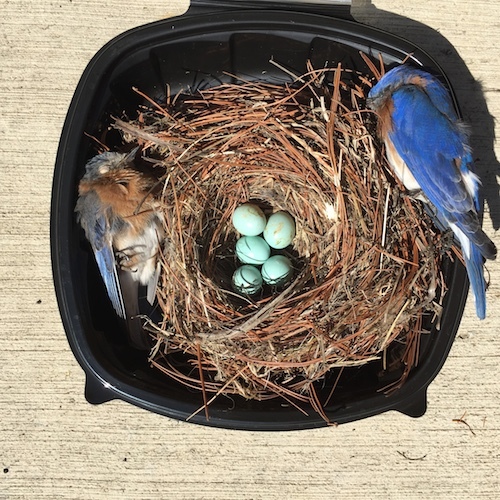 That’s from a bluebird expert… the scouts will be out and about very soon, busy claiming their territory and the best spring digs in hopes of attracting a mate for the cycle of life that is nesting season! 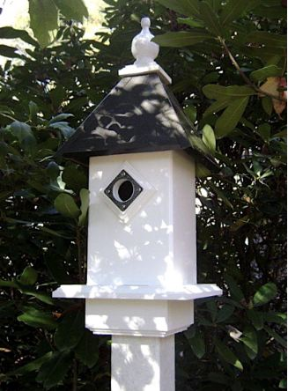 It’s a great time of year for all those “people houses” who host feathered friends too. If you’ve never experienced a family of blues in your yard… this is the year you must try! For those who’ve hosted, and even monitor ed nests, the rewards need not be explained. 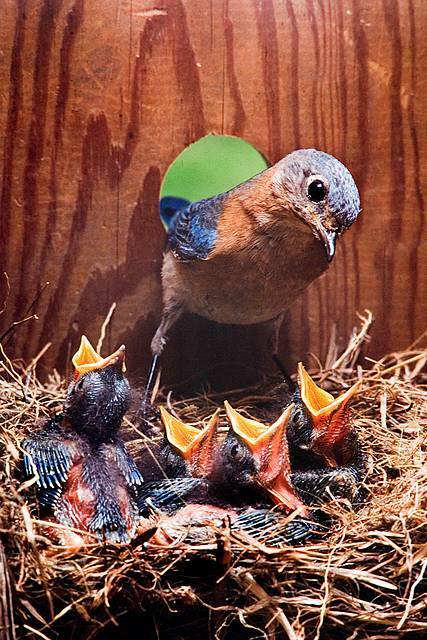 Mom & Dad raise nestlings with some pretty amazing teamwork and TLC. 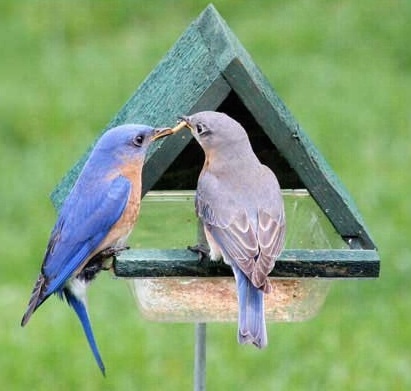 Should bluebirds stick around for a second clutch (very common if the first fledges are successful) you’ll see those juveniles help parents raise the new babies. Totally cool indeed! 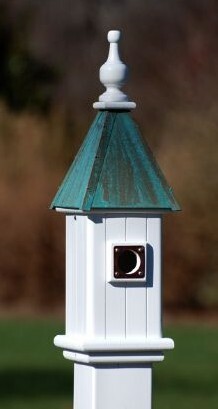 Bluebird houses are best placed in an open area, mounted at about 5 feet high. The houses can be higher, but will prove difficult to monitor-which is a bummer. 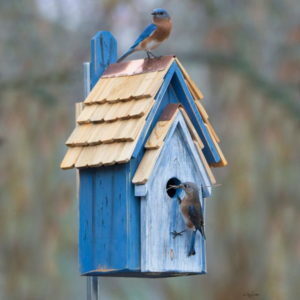 Folks actually help bluebirds thrive by looking out for them and monitoring their houses. Everyone starts somewhere, so an absolute knowledge of the bird isn’t required – but some basic know-how and what to watch for are best for the birds. 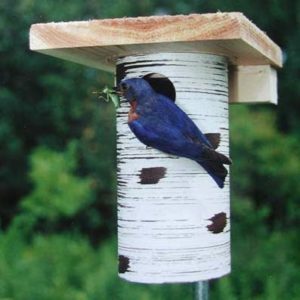 The North American Bluebird Society (NABS) actually rates and approves birdhouses suited for blues. 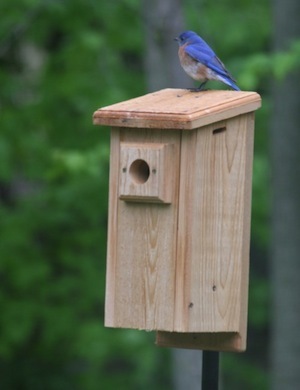 Should you plan to monitor this year, look for a NABS Approved Bluebird House. The website Sialis.org has a wealth of information in an easy to navigate format. 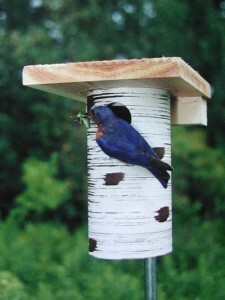 Not just for bluebirds, but info about most North American cavity nesters. 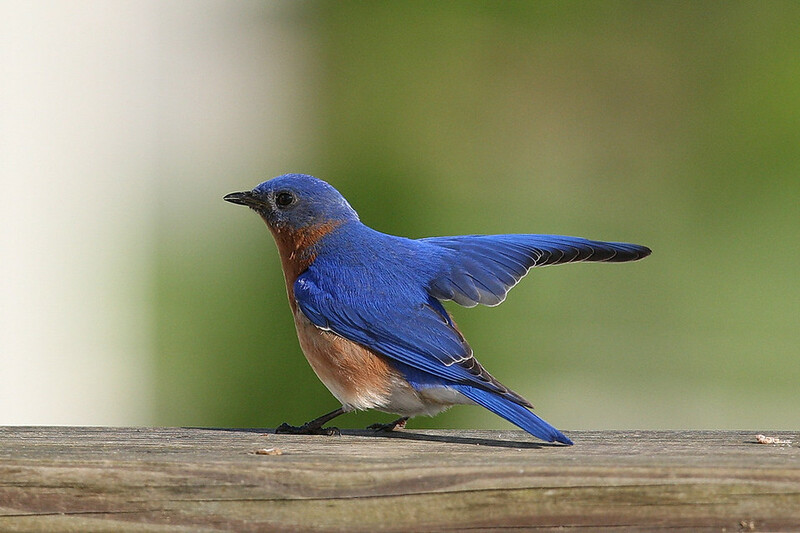 Your state may even have a bluebird society or association who’d be thrilled to help get you started with hosting bluebirds!